Hello, Cailee Veenstra here! I am a recent Social Work graduate from Dordt College and had the amazing opportunity to complete my learning while interning in Chicago. I have had some incredible learning experiences because of this internship, and am abundantly grateful for all those who contributed to my learning. I interned at New Moms, Inc., a non-profit organization in Austin, a neighborhood on the west side of the city. New Moms seeks to enable, empower, and equip young mothers by expressing the love of God to them and their children. 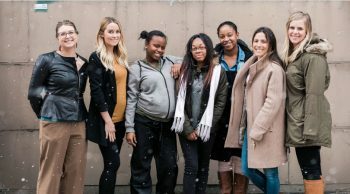 They express this love in a variety of ways – by providing transitional housing for homeless mothers and their children, doula services to pregnant mothers, and professional job training to mothers who are either pregnant or parenting. While I was able to dip my toe into all of these programs and services, the majority of my time was spent in the job training program. The purpose of the job training program is to provide these young women with transferrable skills that they can carry on into securing a permanent job. To teach them these skills, they become employees at Bright Endeavors, a social enterprise that partners with New Moms to make candles. Not only do their candles smell amazing, but the company has had various opportunities to collaborate with other businesses all over the country in special projects. For one of those special projects, for instance, the young women make bath salts for The Little Market, a company owned and operated by Lauren Conrad. During my internship, Conrad herself visited the business, and I got to enjoy checking off “meet a celebrity” from my bucket list! It was at Bright Endeavors that I really began to know the moms and hear their stories. What has continually amazed me while working at my internship is these women’s immutable strength. Even though their situations are less than ideal, they approach each day with integrity, determination, and resilience for one reason – their kids. This strength, the kind I see in mothers who are my age (and often younger than me), is the kind of strength I desire to have. While I quickly figured out that city life was not for me, this internship experience has been crucial to my future success as a social worker and has given me the confidence I need to begin my career. I will forever treasure the memories I made at New Moms, and I count it a privilege to have worked with such inspiring individuals.